The Yeladim Shelanu (Our Children) Foundation created the Starlight Center in 1996, with the help of generous donors from the community, such as the Arison Family Foundation. It is a unique multimedia, computer and audiovisual center empowering children and making them feel more in control of their environment. 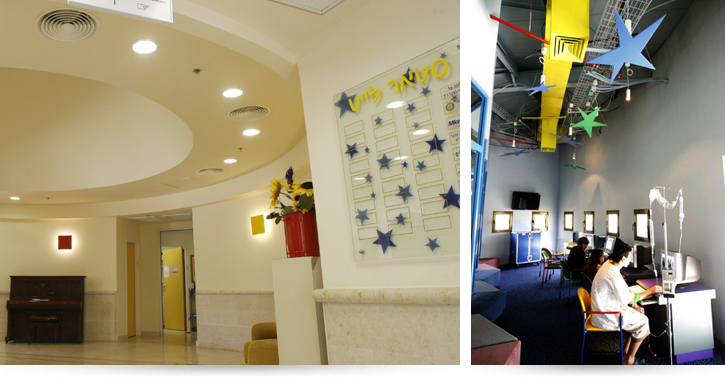 The Starlight Center offers children a unique play space in a special environment where they can forget their illness for a short time, through arts and crafts and computer technology such as internet, tele-conferencing and multimedia computer games. It was developed after years of research, which has proven that children require more than good medicine to heal; they need joy, laughter and play. The Starlight Center serves all the children ages 1 to 18 years who are hospitalized at Schneider Children’s and their families. The medical staff also uses the Starlight for small conventions. Yeladim Shelanu brings Starlight Center activities to the hospital at large, in order to reach every child, even those who are not able to get out of bed and leave their department. Shows which are done pro bono by clowns, storytellers, magicians, singers, puppeteers, etc. A beeper system. Children receive beepers in some clinics, which allow them to wait for their procedure pleasantly at the Starlight Center. They are beeped when their turn comes. Advanced technology such as Wifi internet, Skype and multimedia computer games. If a child is too sick and not able to visit the Starlight, our volunteers bring him a laptop to his bedside. The children can surf the net, play games etc. The Starlight Center operates a very special library in the hospital which offers a selection of books, games for all ages, videos & DVDs about a variety of subjects. The tapes are projected on a large screen in the Starlight center on a daily basis and can also be lent to Departments. The room, which operates as the library today, was not originally planned for a library, and therefore does not answer the growing need for a quiet and pleasant place, where one can choose and match the game, book, or movie to the age and ability of the hospitalized children.